Oh the weather outside is frightful…seriously, we’ve had our first snow storm here in Eastern Pennsylvania. It got cold fast and then we had 6 inches of snow dumped on us the day before Thanksgiving. I keep trying to convince my husband that we need to move to warmer weather, but until then I need to keep my daughter warm and cozy in these freezing temperatures while she is sleeping. Halo sent me one of the micro-fleece SleepSacks to review in exchange for this promotion, and to help us practice safe sleep. The Halo SleepSack is a wearable blanket for babies who are too young to safely sleep with a regular blanket and too old to be swaddled. My daughter will be 1 year old in less than 2 weeks from now and I don’t feel she is ready to sleep with a blanket because she does not always know which way to pull it to get it off. The Halo Microfleece SleepSack is the perfect winter sleep solution for us. The material is 100% Polyester Microfleece so it is very soft, cozy, and warm. It washes nicely and can go in with the rest of my daughter’s laundry. The SleepSack features an inverted zipper which is great because the zipper is not up by my daughter’s chin to irritate her neck or distract her. It also makes any middle of the night diaper changes easier because you would not need to fully undress you baby to get access to the diaper. You can see in the photo above that baby’s feet can come out of the bottom and there is no need to remove the arms or fumble with putting the zipper back together in the dark since it stays zipped at the top. My daughter stays nice and cozy in her Halo Micofleece SleepSack and there is plenty of room at the bottom for her to have enough leg movement to stand up when she wakes and yells for us to come get her. She is easily able to move around in her crib and I have no worries about her getting wrapped up like she might with a regular blanket. In addition to Micro-Fleece the SleepSacks also come in Cotton, Cotton Muslin, Organic Cotton, Luxe Sherpa, Cotton Sweater Knit, and Velboa. They come in sizes appropriate for Preemie up through 24 months (the size chart will help you choose based on your child’s height). Halo also features SleepSack swaddles for nonmobile babies and wearable sleepsacks with foot holes for Early Walkers & Big Kids. Halo Microfleece SleepSacks retail for $25 and can be purchases on their website, on Amazon.com, and from select retailers near you. 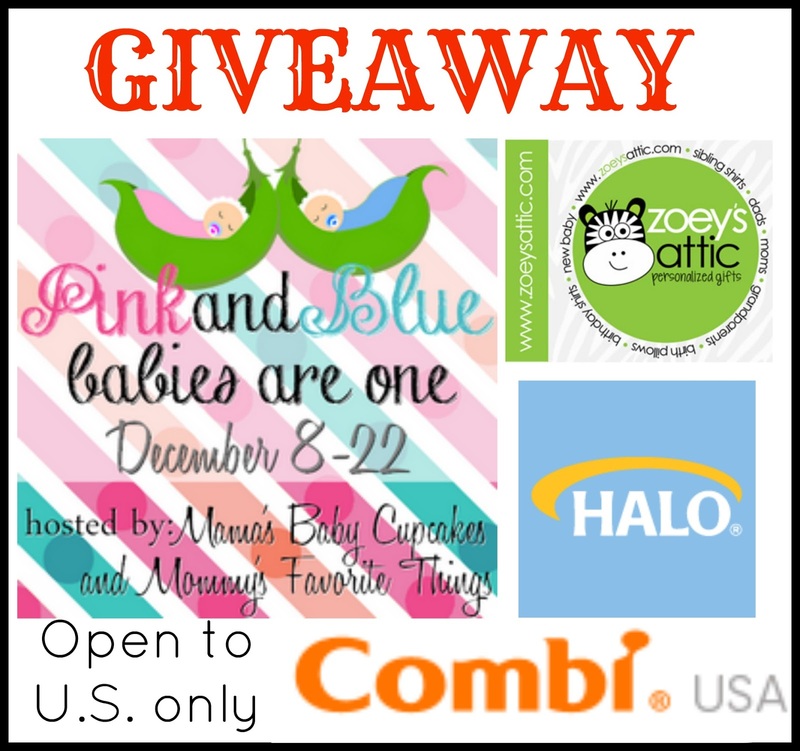 Welcome to the “Pink&Blue: Babies are One” Giveaway Hop hosted by Heather from Mommy’s Favorite Things and Michelle from Mama’s Baby Cupcakes. Last December we celebrated the birth of Michelle’s daughter and Heather’s son, and now they’re turning ONE! In honor of their birthdays, this hop has a toddler theme, which means anything family friendly is up for grabs for the kiddos 1-4yrs old! Each blog has a minimum prize package of $25 per winner and after visiting my giveaway, make sure you use the linky below to take a look at the other blogs to see what they have to offer for you! I have teamed up with Halo for a Microfleece SleepSack Giveaway! This giveaway is open to the US & CAN, age 18+. It will run from 12/8 through 12/22 at 11:59pm EST. Please use the Rafflecopter below to enter. For this hop’s Grand Prize, Michelle has brought you three great sponsors. First up is Zoey’s Attic Personalized Shirts $35 gift card, and Erin offers a variety of items for special occasions and they can be personalized with names, dates, and other milestones. Next you have Halo Sleepsack and their Early Walker wearable blankets. They offer your child the warmth and security of a SleepSack as well as unique foot openings for more mobility when awake. Winner will receive two Early Walkers in boy/girl/neutral colors or prints. Last but not least is Combi USA and their High Chair. The five-position height adjustment allows your child to be positioned properly at any table and the three-position, one-hand-reclining seat will ensure that your child stays comfortable during meal time. It also folds for storage and comes in three colors. Winner gets to choose their favorite color choice! Total Value for this Grand Prize is $269, so enter at Mama’s Baby Cupcakes!! mama pure received a sleepsack in order to facilitate this review. This post contains affiliate links. Halo is responsible prize fulfillment and shipment. This giveaway is in no way associated with Facebook, Twitter, Pinterest, Instagram, or any other social media. Mama’s Baby Cupcakes, Mommy’s Favorite Things and the “Pink&Blue: Babies are 1” participating bloggers are not responsible for sponsors who do not fulfill prize obligations.